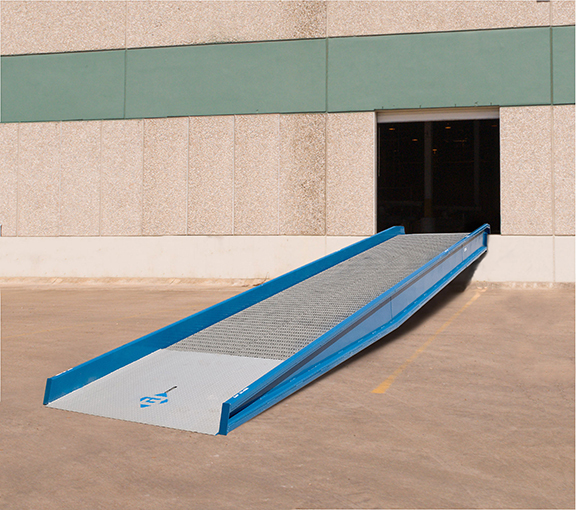 30' Steel Yard Ramp with 20,000 lb capacity. Width 120". For quick loading from dock to ground. The operator utilizes a self-contained, double-acting hydraulic pump to adjust the unit to the proper position. In minutes you are ready to load or unload freight. Solid 18" rubber tires provide easy positioning and towing. Open serrated steel grating provides excellent traction while preventing build-up of snow, water, and other debris. Beveled approach provides a smooth transition.